I decided to step out of my comfort zone and into the world of making a cooking video! For my first venture into this unknown territory I played it safe and did all my cooking off camera and invite you into my kitchen to take a peek at the finished products. This allowed me to get my feet wet so to speak without being completely terrified and making a fool of myself! At least that is what I hope. I told hubby Tom I wanted to make a test video first just so I could get a feel for what I wanted to say and how the video was set up and so forth. He said take one was good enough to use so, I went with it. Of course after viewing it again I saw all the things I forgot to say or things I wished I had said a different way. At the end there is a long pause where he was mouthing to me to wrap it up! I just have to laugh about it now and hope that I get better with practice. I will post the recipe links for the recipes mentioned in the video. Donna’s Cheeze Sauce is a recipe that my friend Donna came up with and it’s the best plant based home made cheeze sauce I have tasted. You will want to use it on your baked potatoes, your veggies and as a dip for oven fries! My daughter and I both love the Chili Lentils for tacos. It makes a big batch and they freeze well. 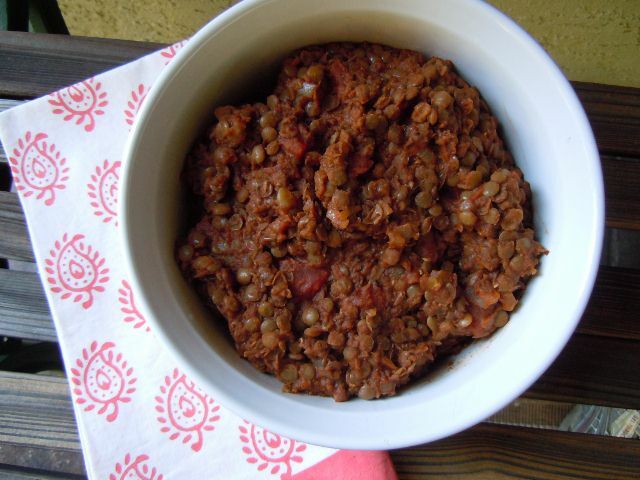 Today I cheated and used a package of Trader Joe’s already cooked lentils – so easy. I like easy. In the video I forgot to mention what I was going to do with the acorn squash I roasted. This is one of my favorite fall recipes. First of all I love acorn squash and the filling is to die for. This past weekend I made a double batch of the filling to take to a pot luck. Instead of stuffing a squash I roasted some delicata squash and diced it to add to the stuffing mixture. It turned out really good! 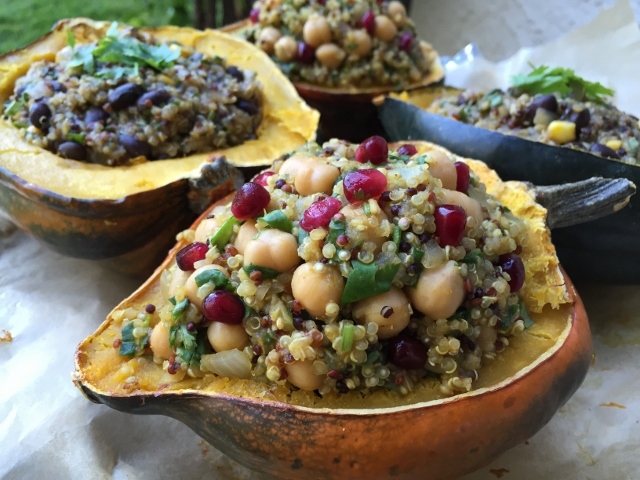 Curry Quinoa Stuffed Acorn Squash. Hearing from you the reader makes me so happy. Seriously I love getting to know people through my blog and have even had the wonderful opportunity to meet some of you in real life! I plan on making more videos and would enjoy having your ideas of what you would like to see in future videos. Please leave me a comment and share your ideas. A Little Nutmeg Nugget: When I started this blog in January of 2010 I followed what I understood to be a healthy version of the standard American diet, ironically also known as the “SAD” diet. As interest in my own health and how it was affected by the food I ate evolved, I transitioned to a whole food plant based diet also known as “WFPB” diet. I have wrestled with the fact that this blog still contains all those posts and recipes from the SAD way of eating I have left behind. I no longer advocate for anyone to eat that way. At this time I am leaving those recipes and posts here. It is a record of my journey and how I came to follow a WFPB way of eating. It is my hope that those who still come here for those old recipes will be curious about what I am doing now. Perhaps they will dip their toes across the line as I did and try some plant based recipes and learn more about the health benefits. Be sure to leave a comment and let me know what you would like to see in a future video! thank you for not taking down your old recipes before you became plant based. My daughter recently decided to go vegetarian. I am from the old school that a meal wasn’t a meal unless there was a meat included. Any recommendations for someone trying to as you said dip there toes in and try a couple vegetarian recipes? Just watched your first video….LOVED it! Thanks for sharing!!! Hi Kim – so good to see your comment. Tell my what types of foods you and your daughter like and I can recommend some whole food plant based options. 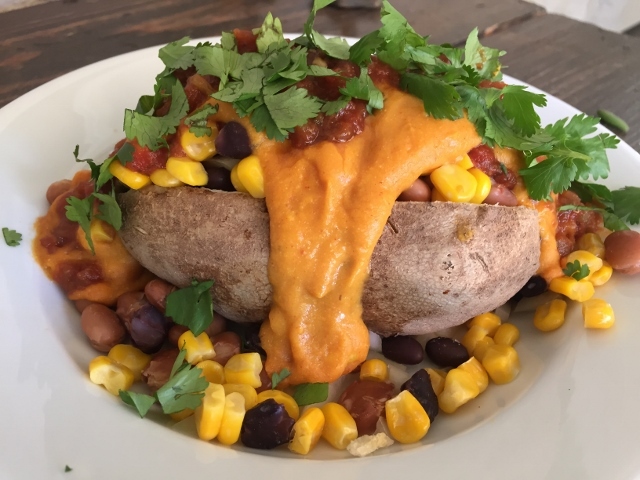 Mexican food is easy to adapt to plant based as well as chili, Indian food,standard American things like mashed potatoes and gravy and so on. Get back to me and I will head you in the right direction! Kim get back to me about what types of food your daughter enjoys now and I will try to direct you to some similar recipes! My daughter is in NYC with the choir/drama club. I know she likes mexican food. Thinking I would like to try something the whole family might like…..everyone else eats meat. Tami – this was a great first video! I just loved it. You have always been an inspiration to me with your wonderful batch cooking photos, posts and suggestions. I am beyond thrilled that you are considering doing some cooking videos. You have a natural gift for instruction, making things simple and clear and also offering valuable tips and ideas. You also have a pleasant speaking style – I highly encourage you to move ahead with future videos. And thank you again for being so generous with your time and knowledge. You are a great ambassador for WFPB eating. Thank you Teri for the encouragement and kinds words. Stay tuned for more videos. Bravo! I love this, and I hope to see more. It’s extremely helpful to see others’ ideas about batching. Much to learn for all of us. Thank you Peggy – I’m so glad you found it helpful. Happy Cooking! Really love following your blog. Great job on your first video! My husband (Tom) and I became passionate about wfpb almost 5 years ago for our health. Of course it has become way more than just the food now. We are caring for the animals and our planet for our grandchildren. We do love our food and I love cooking it. My Tom, who is not a cook is now in charge of baking the potatoes and rice. Thanks for the inspiration. Somehow I know if it’s on your blog, I can give it a try and we will enjoy it. Looking forward to your next video! Thank you so much for your kindness and support. That means a lot to me. Congratulations to you and your hubby Tom for adopting a healthy lifestyle! You look so at ease. Great Tami!!!! Thank you Jody! I am really enjoying making the videos – its fun! I just found your website. Your video made me feel like this was something I could actually do! My husband and I are trying to transition to all plant based, but some of the recipes in books and websites are so different than what we are used to-ingredients we can’t get in our small town and ingredients we just don’t use and aren’t familiar with. Your video made so much sense to me–we wouldn’t be struggling every night figuring out what to eat! I hadn’t really thought that I could cook all those potatoes and leave them in the fridge! If I get brave, I’ll try the “cheese” sauce”! Thanks so much. Congratulations on transitioning to a whole food plant based diet. I can tell you that in the beginning I made things far too difficult and it was overwhelming. Once I figured out how to batch cook and make simple meals it all fell into place. Now I don’t worry about what we are going to eat because I always have the ingredients ready to combine and reheat and eat. We love this way of eating so much! Do try the cheeze sauce just don’t expect it to taste like what you were used to on a omnivore diet. It does take a while for our taste buds to adapt to the new way of eating. But once you adapt the fresh food tasted incredible! Fruit starts to taste super sweet and everything really just seems to have so much more flavor. Check in often and let me know how you are doing. If I can answer any questions I would be happy to do so. Loved the video! It was very informational and helpful. I like seeing how people prepare for the week. I hope you make them regularly. One note…on my computer the volume was just a tad bit low, even on my highest setting. I would ask others if they had the same experience….maybe it is just my computer (or my hearing). Again, you are very engaging to watch…..waiting for more! Thank you so much for the feedback. One other person did mention that the volume was too low. I used a wrong setting when I posted it to You Tube so my hubby posted it again and it seems to be better now. I made another video about how to make my favorite salad and we used a different camera and the volume seems much better. Thank you for your kind remarks! Loved it! Batch cooking is key to staying on plan, having delicious “fast” food ever-ready. The crisping tray was a new (and excellent) idea. Thanks for this video. I am glad to know you are another batch cooker! I love the crisping tray – makes delicious fries. That was wonderful! I just found you today through facebook. I am so glad you found my blog! Thank you for the batch cooking video. It truly inspired me. Am looking forward to watching more videos. Great Job. Hi Donna, I am so glad you found it helpful!